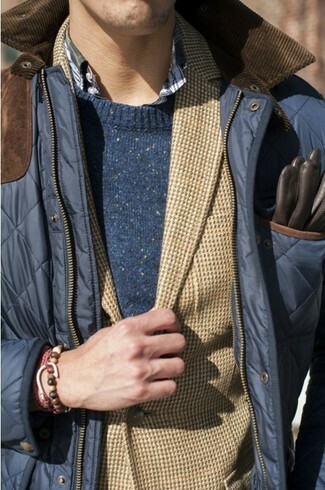 Wear a Canada Goose navy crew-neck sweater with navy check dress pants to ooze masculine refinement and class. If you're after a casual yet stylish getup, reach for a Canada Goose paterson regular fit merino sweater from Nordstrom and grey chinos. Both items are totally comfortable and will look great paired together. When it comes to footwear, this getup pairs nicely with black leather espadrilles. 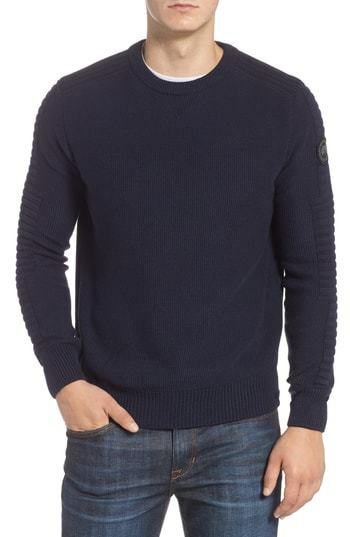 This casual combo of a Canada Goose Paterson Regular Fit Merino Sweater from Nordstrom and navy skinny jeans is super easy to throw together without a second thought, helping you look stylish and prepared for anything without spending too much time rummaging through your closet. 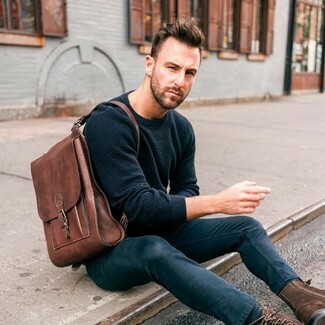 You could perhaps get a little creative in the footwear department and dress up your look by sporting a pair of dark brown suede casual boots. If you're looking for a casual yet sharp getup, consider wearing a navy crew-neck sweater and yellow chinos. Both items are totally comfortable and will look great paired together. To add elegance to your ensemble, round off with black leather derby shoes. If you're after a casual yet sharp ensemble, dress in a Canada Goose paterson regular fit merino sweater and a navy quilted barn jacket. Both garments are totally comfortable and will look great together. If you're hunting for a casual yet dapper getup, consider pairing a Canada Goose paterson regular fit merino sweater with beige shorts. Both garments are totally comfortable and will look great together. When it comes to shoes, this outfit is finished off perfectly with dark brown suede driving shoes. If you're looking for a casual yet stylish outfit, go for a Canada Goose paterson regular fit merino sweater and mint chinos. Both pieces are totally comfortable and will look great together. 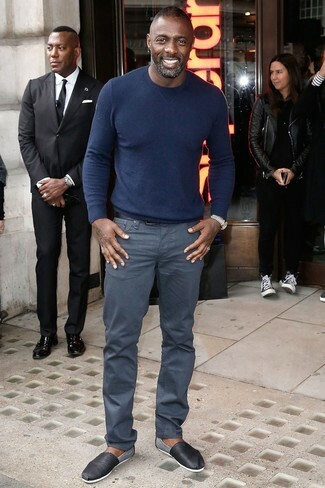 Throw in a pair of tobacco low top sneakers to make the ensemble more current. 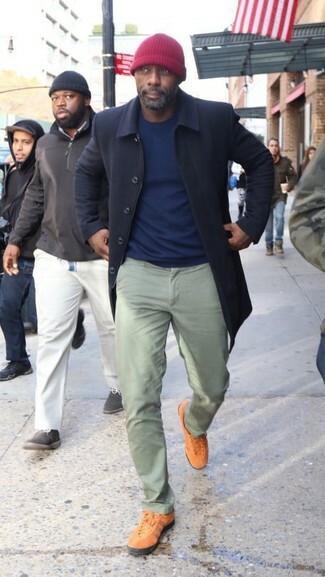 If you're scouting for a casual yet sharp outfit, marry a navy crew-neck sweater with khaki chinos. Both garments are totally comfortable and will look great together. For something more on the daring side to finish off this look, go for a pair of navy canvas low top sneakers. If you're hunting for a casual yet dapper ensemble, wear a Canada Goose paterson regular fit merino sweater with navy chinos. Both garments are totally comfortable and will look great together. Play down the casualness of your outfit with brown leather derby shoes.